Offering an eclectic Collection of American Turquoise and Southwest Native American Artisan Silver Jewelry consisting of unique one of a kind treasures from Navajo, Zuni, Hopi. 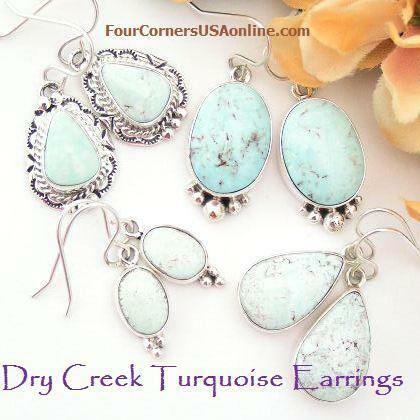 Shop Four Corners USA Jewelry Online Store for an extensive selection of Dry Creek Turquoise Jewelry, White Turquoise Jewelry and Native American Navajo Wedding Rings, Engagement Rings, Bridal Sets and Bridegroom Wedding Bands in stock for immediate delivery as well as pre-order and custom order. Our Dry Creek Turquoise Jewelry Collection is unsurpassed with an exquisite and diverse selection of Style, Stone Selection, Price Points and Native American Jewelry Designer Silversmiths such as Jane Francisco, Shirley Henry, Thomas Francisco and Nita Edsitty. 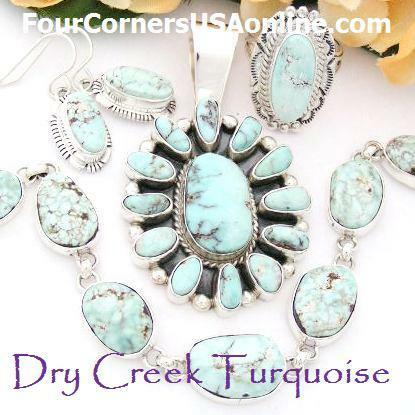 There is always an extensive and ever changing choice of Dry Creek Turquoise Earrings, Dry Creek Turquoise Pendants Necklaces, Dry Creek Turquoise Rings, and the elusive Dry Creek Turquoise Link Bracelets. Are you in a Black and White Mood? Consider a choice from our large selection of White Buffalo Turquoise Jewelry. 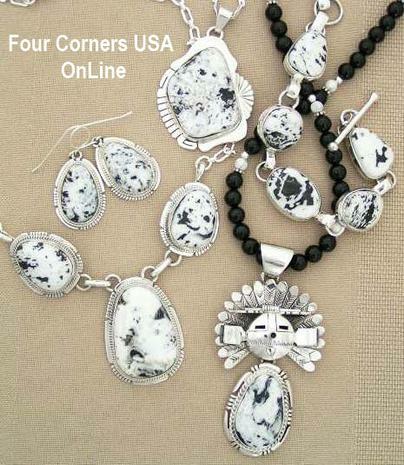 Striking Black White coloring makes this stone a favorite with modern southwest Native American Jewelry Designers such as Navajo Silversmith Tony Garcia, Lester Jackson and Argke Nelson. With beautiful specialty jewelry items ranging from sedate to ornate, you are certain to find a treasure to fit your style whether from our White Turquoise Earrings selection, White Turquoise Rings, White Turquoise Pendants Necklace Sets, White Turquoise Bracelets or White Turquoise Watches for both Men and Women. 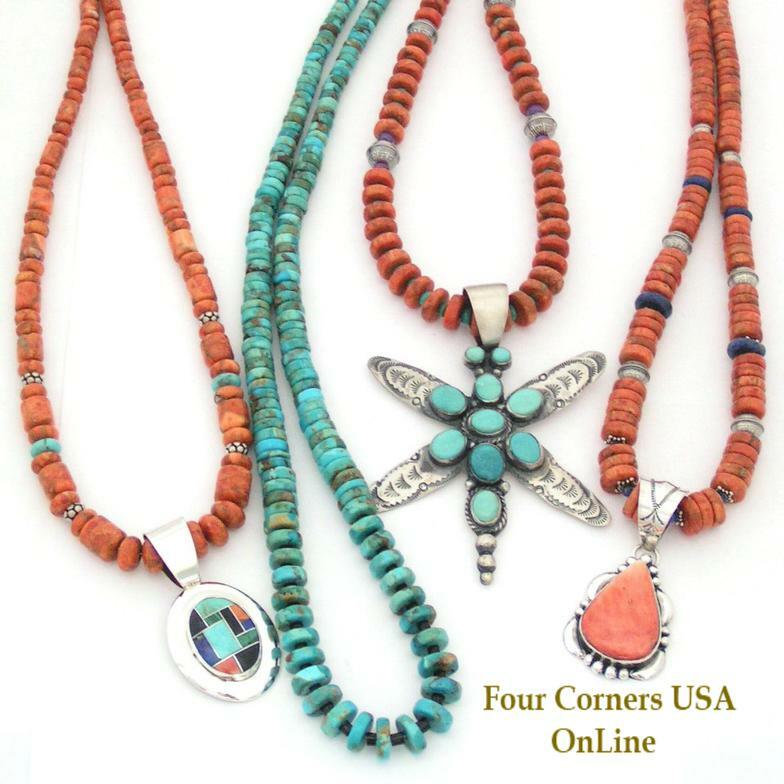 Compliment your Native American Turquoise Jewelry Southwest Style with a handcrafted original bead Necklace from Four Corners USA Jewelry. We specialize in American Kingman Turquoise Beads for Jewelry Designers and create the perfect accompaniment for many of the creations from our Native American Silversmiths. With such a variety of Turquoise and Coral Bead Supplies available to us, we are not afraid to mix and match our Turquoise mines for just the right color or contrast. 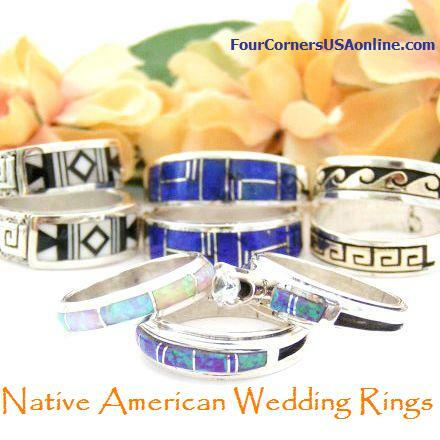 At Four Corners USA OnLine Jewelry Store you will find a large selection of Native American Navajo Wedding Rings in stock for quick delivery. Whether you are celebrating a New Commitment, Special Anniversary or Renewing Vows we offer a variety of styles including mixed metal 14K Gold Sterling Band Rings and classic Inlay Turquoise Bridal Engagement Wedding Ring Sets and matching Band Rings by two accomplished Navajo Jewelry designers.